These incredible looking flowers are monkey orchids. 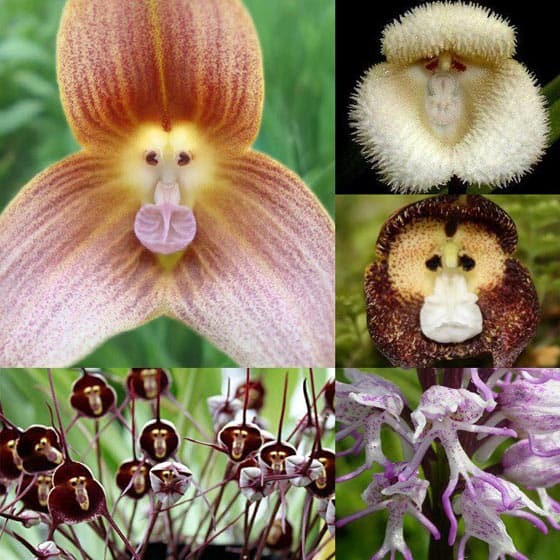 There are two species shown here, Dracula simia which look like monkey faces and Orchis simia which resemble little dancing monkeys. Dracula simia are only found in the cloud forests of southeastern Ecuador at elevations of 1000 to 2000 meters and their flowers smell likes ripe oranges. Orchis simia are found in Europe, the Mediterranean, Russia, Asia Minor and Iran and the flowers smell strongly of feces!